Today, al-Qaida in Iraq (AQI) finds itself in a very difficult position. U.S. and Iraqi government forces have killed many of the group's top leaders. The American troop surge and the change in counterinsurgency strategy that began in early 2007 have made it more difficult for AQI to carry out attacks. The terror group "took a big hit after the surge. Violence fell 90 percent," said Long War Journal Editor Bill Roggio. AQI controlled substantial amounts of Iraqi territory before the surge, but is no longer able to do so, he said. Today, the group is forced to operate through covert cells in Iraqi cities. Though weakened, the group retains substantial capability to target Iraqi civilians. On August 15, insurgents launched a devastating series of attacks covering nearly every region of the country, killing 86 people and wounding more than 300. "In all there were 37 attacks, more than double the daily average this year, nearing the level of violence at the height of the sectarian violence here in 2006 and 2007," the New York Times reported after the carnage. The terror spree included two suicide bombers, 11 car bombs, and 19 improvised explosive devices. A few days later, an AQI affiliate called the Islamic State of Iraq (ISI) vowed more terrorist attacks to avenge the killing of Osama bin Laden and two previous ISI leaders. On Aug. 28, a suicide bomber killed at least 28 people and wounded at least 41 others in an attack on a Sunni mosque in Baghdad. But, Roggio said, the bombings don't change a fundamental reality: AQI is "a shell" of its former self, a point reflected in plummeting levels of violence since the surge began in early 2007. Iraqi military and civilian fatalities in the war dropped from more than 3,000 per month during February 2007 to 184 during July 2011. Coalition military deaths fell from 85 to zero during the same period. AQI has between 500 and 1,000 members, Roggio said, down substantially from an estimated 11,000 to 12,000 when the surge began. One-hundred fifty to 200 jihadists per month crossed into Iraq (nearly all of them from Syria) before the surge; today, the number is down to 20 to 30 per month, he told the Investigative Project on Terrorism. While AQI is "still dangerous," the group has become "an afterthought" when it comes to carrying out terrorist attacks, Roggio said, adding that Iranian-backed Shiite terror groups have eclipsed al-Qaida as the main jihadist threat to Iraq. Abu Musab Zarqawi, a native of Jordan, played a key role in establishing AQI in Iraq. In 2000, Zarqawi met with Osama bin Laden in Afghanistan and established his own terror network: al-Tawhid wal-Jihad (Monotheism and Holy War). After 9/11, Zarqawi crossed into Iran, but was forced to relocate to Iraq in 2002 after German authorities arrested eight Tawhid members for plotting terror attacks against Jewish targets. He spent much of his time in Iraq with Ansar al-Islam, a jihadist group based in the northern part of the country. According to the Jordanian government, Zarqawi was behind the October 2002 assassination of U.S. diplomat Laurence Foley, who was fatally shot outside his home in Amman. Jordanian agents said three men confessed that they had been armed, recruited and paid by Zarqawi, who was sentenced to death in absentia. Zarqawi returned to Iran around the time of the U.S.-led invasion of Iraq in March 2003, where he met with Osama bin Laden's military chief, who asked him to help coordinate the entry of al-Qaida operatives into Iraq. Zarqawi agreed, and by the fall of 2003 a steady stream of jihadists was crossing the border from Syria into Iraq to fight coalition forces. U.S. officials have said Zarqawi's network was involved in a number of large-scale car-bomb attacks in late 2003. Those included the Aug. 19 bombing of the United Nations headquarters in Baghdad, which killed 23 people including Sergio Vieira de Mello, the top UN envoy in Iraq. Ten days later, at least 85 people died in a bombing outside the Imam Ali mosque in Najaf, one of Shiite Islam's holiest sites. Among the dead was Ayatollah Muhammad Baqr al-Hakim, one of Iraq's top Shiite leaders. A November 2003 attack on Italy's paramilitary police in Nasiriya killed 30 people. In 2004, the group carried out and videotaped the beheading murders of three Americans: Nicholas Berg (killed on May 11); Jack Hensley (Sept. 21); and Jack Armstrong (Sept. 22). In October 2004, Zarqawi's organization pledged allegiance to bin Laden and joined al-Qaida. Since then, it has carried out its attacks in the name of AQI. Zarqawi was given the title "Emir of al-Qa'ida in the Country of Two Rivers." The group was designated a Foreign Terrorist Organization by the State Department, and the U.S. government put a $25 million bounty on Zarqawi's head. Zarqawi and AQI targeted Jordan as well. In November 2005, they bombed three Amman hotels, killing at least 54 people. Zarqawi was also linked to a failed 2004 plot to attack the U.S. embassy and other targets in Jordan with chemical weapons. In January 2006, AQI created the Mujahideen Shura Council - an umbrella group that was intended to encompass all of the Sunni terror organizations in Iraq. Zarqawi adopted a strategy of carrying out mass-casualty attacks targeting Shiites and their religious shrines. A three-day series of suicide bombings across Iraq in July 2005 killed 150 people and wounded 260 more. The most high-profile attack was the Feb. 22, 2006 bombing of the Askariya mosque 65 miles north of Baghdad. Within 24 hours, more than 20 Sunni mosques across Iraq were shot up, set afire or bombed killing at least 18 people. Zarqawi was killed in June 2006 when two U.S. F-16 jets dropped several 500-pound bombs on a safe house located five miles west of Baquba. He was replaced by Abu Ayyub al-Masri, an Egyptian jihadist who was a protégé of al-Qaida's then-second in command Ayman al-Zawahiri. 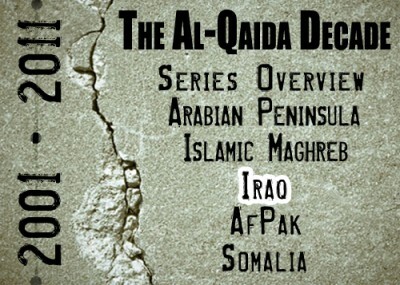 AQI claimed its attacks in the name of the council until November 2006, when jihadists declared the establishment of the "Islamic State of Iraq" – the first step towards al-Qaida's goal of establishing a caliphate over the region. AQI's brutal tactics triggered a backlash from tribesman in Anbar province in western Iraq. Incensed over its encroachment into their territory, Sunni Muslim forces formed militias and in the summer of 2006 began a campaign of killing al-Qaida operatives and collaborators utilizing the same brutal intimidation tactics as AQI. Their movement soon became known as the Anbar Awakening. Washington began courting these Sunni tribesmen, many of whom had joined al-Qaida in fighting the U.S.-led coalition forces in Iraq. The Sunnis eventually concluded that al-Qaida was a greater threat than the U.S. military and joined the fight against the jihadists. By the spring of 2009, 100,000 former insurgents were on the United States' payroll and fighting AQI. In tandem with its efforts to court Awakening members, President Bush ordered an additional 20,000 soldiers to Iraq during the first six months of 2007. This "troop surge" – part of a new counterinsurgency strategy to protect Iraqi civilians from terrorists – to a heavy toll on AQI. By early 2008, al-Qaida, which had been estimated to have between 12,000 and 15,000 members, saw more than 11,000 of its members killed or captured. The reward for capturing AQI's leader had dropped from $5 million to $100,000. Even with the reduction in the bounty, U.S. and Iraqi security forces successfully have targeted a number of Zarqawi's successors in the jihadist leadership. On April 18, 2010, for example, a U.S. airstrike killed Masri and Abu Omar al-Baghdadi, leader of the Islamic State of Iraq. AQI has been hard hit by its inability to occupy territory following the surge, Roggio said. When the group held territory, it could extort substantial sums of money from oil-company truck drivers as they passed through. Now that it is operating out of covert cells, the group no longer has the ability to set up the checkpoints necessary to carry out effective shakedowns. "Extortion plays much less of a role" in financing AQI operations compared to five years ago, he said. In the wake of AQI's decline, Iranian-backed jihadist organizations have supplanted it as the number one terrorist threat to Iraqi security, Roggio said. Yet AQI remains dangerous, particularly when it comes to attacks against "soft" civilian targets. On Oct. 31, 2010, it attacked a Baghdad church, triggering a hostage siege in which more than 50 people were killed. Several days later, the group launched coordinated attack in Baghdad, detonating more than 15 car bombs and killing more than 90 people. AQI's media production house, al-Furqan Media, continues to produce jihadist videos. There are also reports that hundreds of Awakening members, driven by frustration with their treatment by the Shiite-dominated Iraqi government, have rejoined al-Qaida, which has embarked on a campaign to persuade disaffected Sunnis to rejoin the jihad. Roggio, who has made numerous trips to Iraq, expressed skepticism that AQI would achieve much success. Iraqis have seen the jihadists "for what they were, a violent, nihilistic group interested only in slaughter." In recent interviews with al-Shorfa.com, a website operated by the U.S. military, Iraqis explained why they want nothing from jihadist elements like AQI. "They are nothing but filthy groups who sold out their homeland and their conscience for a fistful of dinars," said Nawful Ali, 29, who works at a transportation firm in Baghdad. A 31-year-old factory worker in Baghdad said Iraqis have decided to reject terrorists and could best serve their country by turning them over to security forces. In the coming years, Roggio predicted, al-Qaida in Iraq will continue much as it is today: Watching its lethal power decline, but continuing to carry out large-scale attacks against soft civilian targets.